Without planning, health-care expenses in retirement can reduce income and erode savings. Policy measures could improve the path to success for retirement savers. The rising cost of health care can undermine retirement readiness. But many Americans may not realize that the effects may be mitigated with planning. Some near-term policy changes could help savings last longer. Traditionally, investors have focused on inflation and taxes as potential risks to retirement savings. But health-care costs have grown to exceed by far those financial pressures. Average health insurance premiums for individuals have risen more than 200% over the past 18 years, outpacing wage and overall inflation. 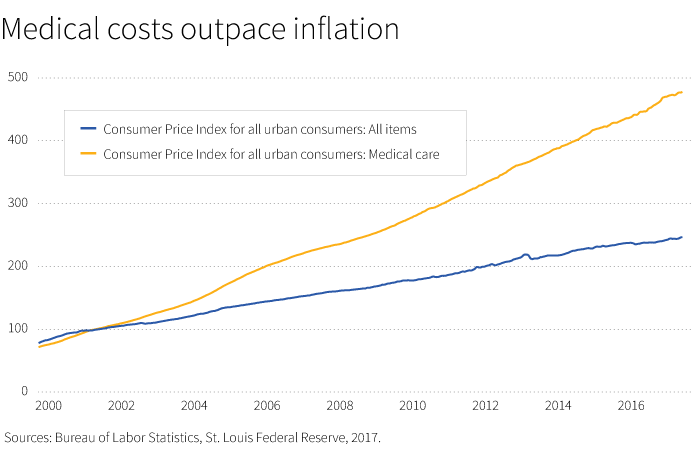 Since 2000, the Federal Reserve notes that medical-care inflation rose by 477%, compared with 247% for overall inflation (CPI). At the same time, wages for most workers have been stagnant. As both Social Security and private savings are funded by payroll deductions, the slow pace of wage growth has hobbled any intent to boost retirement savings. Since the 1980s, productivity has outstripped wages, in part as a consequence of offshoring and automation of industrial jobs. Today, wage growth still remains sluggish even in an improving job market. The demand for workers is strong, but many of the jobs being created are low-wage jobs. Health-care costs pose a challenge to retirement savings in many ways. For current savers, as costs rise it becomes harder to ensure that future income will keep pace. In addition, health-care expenses during the working years means less income is available for saving. As Millennial-generation workers try to keep up with college and credit card debt, they may find it more difficult to set aside money for health costs and retirement. For people in retirement, out-of-pocket expenses that are not covered by Medicare can use up income and possibly erode principal. Planning for health-care in retirement, like planning for longevity, is a challenge. At the same time, it’s critical, and should be part of any comprehensive financial plan. Multiple academic and research organizations have projected required health-care savings in retirement. These guidelines are an important starting point for discussion. The Employee Benefit Research Institute, for example, found that a couple with average prescription drug expenses would need $265,000 if they wanted a 90% chance of meeting likely costs. A 65-year-old man would need $127,000 and a woman would need $143,000, EBRI noted. While the numbers can be daunting, they can foster an important conversation about financial planning. Individuals may consider seeking expert advice to craft a plan. Empower’s Lifetime Income Survey shows that investors with a financial plan that includes health-care expenses were on track to replace a higher level of income in retirement (102%), compared with savers without a formal plan (58%). Note the average worker was projected to replace only 62%, the study found. The next generation of workplace savings plans will need to address issues of lifetime income and health-care costs in retirement. Programs such as Social Security and Medicare are already under pressure and the outlook for benefits is unclear. Policies approved today may make the difference. Among our recommendations (throughout this blog) for the next generation of workplace plans — Workplace Savings 4.0 — we believe it is essential to allow retirees to make tax-free withdrawals from qualified plans if they are used to cover health insurance or medical care. Through policy moves, we can improve the infrastructure to put a better retirement in reach for all workers. Including a recommendation to help retirees cover health-care costs is an important part of this effort. Even with these reforms, some retirees may still face savings shortfalls, particularly those with chronic illnesses. The risk of needing long-term care, provided in a nursing facility, is one that may not affect the majority of retirees, but will affect some in significant ways. To that point, fostering the growth of an efficient, nationwide market for affordable long-term care insurance is a worthy related goal that may also require federal legislation. If we can work together and adopt these recommendations, it would be a major advance for workplace savings and the future for many retirees. It would also be an example of America’s ability to take on substantive challenges and solve them.